I heard a noise outside our house so I tried to peep on our window to check it out and to my surprise, I saw our neighbor harvesting the fruits of our mango tree! If I'm not mistaken, they were able to get a bunch of mango fruits about more or less 2 big plastic bags. That's a lot! It's not that I don't want to give them but they should have asked permission from the owner first. It's a sign of disrespect to neighbor. Our neighbor together with her panungkit! So rude! She just kept on harvesting the fruits without our permission. Actually, her whole family are harvesting. What a great way to spend time with the family. Awww.. 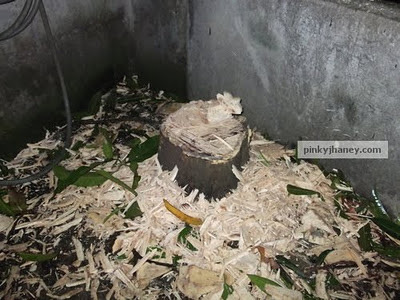 I feel sad for the mango tree.. :( Anyway, your neighbors are rude ah! Have you tried talking to them about their inappropriate family past-time? Our neighbor also has a mango tree, but he's the one offering us pa nga to get some fruits since they don't harvest them anyway. PS: Visiting from GT. Hope you can check my blog too, and follow if you like. Thanks! ^I tried it sis but they are narrow minded. Sila pa ang nagalit sa min. i love mango, sayang yung tree. i hate neighbors who are so insensitive. ^Sobrang namimiss ko na nga yung mango tree namin sis. Anyway, Merry Christmas! Ang pink ng blog mo. I like it!